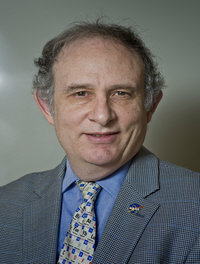 Jack Kaye currently serves as Associate Director for Research of the Earth Science Division (ESD) within NASA’s Science Mission Directorate (SMD). He has been a member of the Senior Executive Service since August, 1999, managing NASA’s Earth Science Research Program. Earlier positions in his more than 30-year career at NASA include being a Space Scientist at the Goddard Space Flight Center and Manager of the Atmospheric Chemistry Modeling and Analysis Program at NASA HQ. In addition, he has held temporary acting positions as Deputy Director of ESD and Deputy Chief Scientist for Earth Science within SMD. His academic training is in chemistry (B.S. Adelphi University, 1976; Ph.D., California Institute of Technology, 1982). He also held a post-doctoral research associateship at the US Naval Research Laboratory. As Associate Director for Research, Dr. Kaye is responsible for the research and data analysis programs for Earth System Science, covering the broad spectrum of scientific disciplines that constitute it. He represents NASA in many interagency and international activities and has been an active participant in the US Global Change Research Program (USGCRP) in which he has served for several years as NASA principal and Vice Chair of the Subcommittee on Global Change Research (from Jan., 2009 through May, 2010 he served as the Acting Chair for these activities). He also serves as NASA’s representative to the Subcommittee on Ocean Science and Technology. He previously completed a six-year term as a member of the Steering Committee for the Global Climate Observing System and currently serves an ex officio member of the National Research Council’s Roundtable on Science and Technology for Sustainability and the Chemical Sciences Roundtable. He has received numerous NASA awards (most recently, the Outstanding Leadership Medal in 2009), as well as been recognized as a Meritorious Executive in the Senior Executive Service in 2004 and 2010, and named as a Fellow by the American Meteorological Society in 2010 and the American Association of the Advancement of Science in 2014. He was elected to serve as co-secretary of the Atmospheric Sciences Section of the American Geophysical Union (AGU) for 1998-2000 and earlier served on the AGU Publications Committee. The AGU has recognized him on two occasions with a Citation for Excellence in Refereeing. He has published more than 50 refereed papers, contributed to numerous reports, books, and encyclopedias, and edited the book Isotope Effects in Gas-Phase Chemistry for the American Chemical Society. In addition, he has attended the Leadership for Democratic Society program at the Federal Executive Institute and the Harvard Senior Managers in Government Program a the John F. Kennedy School of Government at Harvard University.